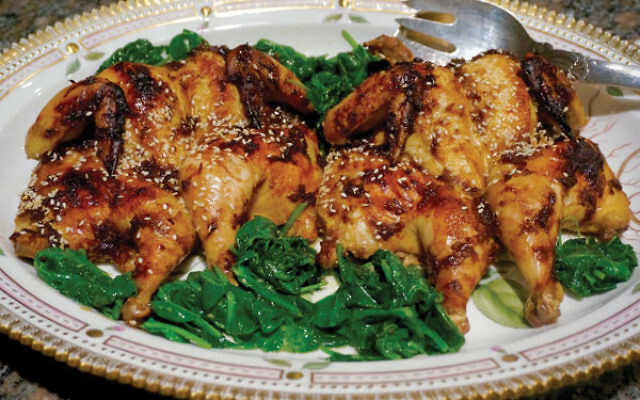 Roasted chicken is, of course, a time-honored dish for Shabbat and other holidays. But Cornish hens can seem more appropriate for one of the High Holy Day meals — especially when you’re preparing so many meals (Rosh Hashana, the pre- and break-the-fast meals and on to the Sukkot feast) in such a short time. They’re much smaller than regular chickens, which means you make several of them rather than one large bird. Presenting them together on a platter is visually attractive, making the dish less ordinary, more celebratory. The small size also means they cook faster and, although you can roast them whole and serve one small bird per person, more often than not one Cornish hen weighs about one to one-and-a-half pounds, enough for two people, so you can split them in half before roasting, cutting the time even more. In addition, Cornish hens, like regular chicken, are fairly mild tasting and you can season them, glaze them, sauce them, and so on with all sorts of flavorings that suit your family. Sprinkle them with ras el hanout or with garlic, oregano, and lemon. Coat them with curry and baste with pineapple juice or with a dukkah spice blend and baste with white wine. Serve them savory, baked over a bed of shredded vegetables, or sweeten them with a glaze of honey and bake them with fruit. There’s almost no limit to how you can make these little chickens tasty, unusual, and different each time you cook them. 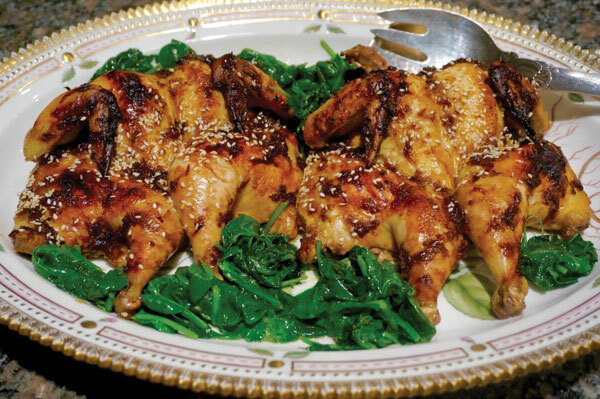 Cornish hens can be made ahead, as you can see in the recipe for Orange and Honey Hens with Sesame. Although the honey gives the dish a sweet undertone, it is balanced well with refreshing fresh ginger and orange peel. Soy sauce and hoisin sauce add a savory quality. I add fresh lemongrass to the mix when I can find it — it gives the birds a more citrusy zing — but it isn’t essential. I usually serve this dish with sautéed greens (spinach, kale, or chard) and cooked Israeli couscous. By the way, although Cornish hens are sometimes sold as “game hens,” they are not game; they are a breed of broiler chicken, grown for a large breast size at a younger age than a traditional broiler chicken. In addition, they are referred to as hens, but they may not be. But they are flavorful, succulent, and oh so handy for special occasions. Combine orange juice, honey, soy sauce, hoisin sauce, orange peel, garlic, ginger, lemongrass, and sesame oil in a saucepan. Bring to a boil over moderately high heat and cook five-six minutes or until the liquid is reduced to about 3/4 cup. Set aside to cool. Wash and dry the hens and cut them in half lengthwise through the backbone. Place them skin side up in a roasting pan and spoon the cooled liquid over them. * When ready to roast the hens, preheat the oven to 400 degrees. Place the pan in the oven and cook for 10 minutes. Baste and cook for another five minutes. Reduce the heat to 350 degrees and cook for 10 minutes. Sprinkle with sesame seeds. Roast another 10 minutes or until the hens are cooked through.